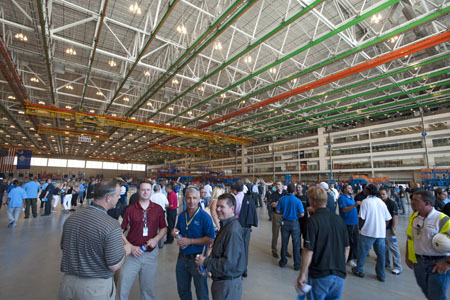 Boeing South Carolina teammates, elected officials and representatives from community and business groups, suppliers and subcontractors tour the new 787 Dreamliner Final Assembly building in North Charleston, S.C. during the building's opening ceremony on June 10, 2011. NORTH CHARLESTON, S.C., June 10, 2011 /PRNewswire/ -- Elected officials and representatives from numerous community and business groups, suppliers and subcontractors joined more than 1,000 Boeing [NYSE: BA] employees at its North Charleston, S.C., facility today for a ribbon-cutting ceremony to mark the opening of the new 787 Dreamliner Final Assembly building. "In this building, our talented Boeing South Carolina teammates are going to assemble the finest, most technologically advanced commercial widebody airplane in history," said Jack Jones, vice president and general manager of Boeing South Carolina. "Airline customers from around the world will come to the South Carolina Lowcountry to take delivery of their 787s, and we look forward to demonstrating what 'made with pride in South Carolina' is all about." Boeing's Site Services Group and BE&K/Turner, the design-build team, were recognized at the ceremony for their work in bringing construction of the building to completion six months ahead of schedule. In addition the BE&K/Turner team has worked 3.7 million labor-hours without a lost time incident. Employees began moving into the new building in May, and final assembly of the first South Carolina-built 787 Dreamliner will begin later this summer. "Our partnerships with state and local government and industry have made today possible," said Marco Cavazzoni, vice president and general manager, Final Assembly & Delivery, Boeing South Carolina. "I have a lot of gratitude and respect for every person who has worked hard to help build this new 'house' for us. Every person who steps through these doors is making history, and that's something we should all take pride in." In April, Boeing announced that thin-film solar laminate panels would be installed on the roof of the Final Assembly building. This solar installation will provide up to 2.6 megawatts of electrical power for the site and is the largest in the Southeast by production capacity. The new Final Assembly building features 642,720 square feet (59,711 m2) of covered space, roughly the equivalent of 10.5 football fields. More than 18,000 tons (16,329 mt) of steel and one million cubic feet (28,316.8 m3) of concrete were used in its construction. At full production rate, the South Carolina Final Assembly facility will produce three 787 Dreamliners per month.